honors, awards and performances since the December 2017 Recital! CONGRATULATIONS TO MY FABULOUS SENIOR ON ALL HIS ACCOMPLISHMENTS! honors, awards and performances since the December, 2016 Recital! honors, awards and performances since the December, 2015 Recital! honors, awards and performances since the December, 2014 Recital! BEST WISHES TO DAVID AND RALLES AS THEY GO OFF TO COLLEGE IN THE FALL!! WE’LL MISS YOU!! honors, awards and performances since the June, 2014 Recital! Benefit Concert for Kenya and Haiti – NextGen Church, West Windsor, N.J.
honors, awards and performances since the December, 2013 Recital! honors, awards and performances since the June, 2013 Recital! honors, awards and performances since the December, 2012 Recital! 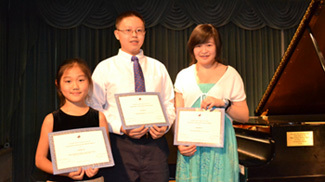 honors, awards and performances since the June, 2012 Recital! WITH BEST WISHES FOR A HAPPY AND HEALTHY HOLIDAY SEASON FOR ALL!! honors, awards and performances since the December 2011 Recital! CONGRATULATIONS TO AMANDA LI, WHO WILL ATTEND PRINCETON UNIVERSITY THIS FALL! WE WILL MISS YOU! Performed on the Oprah Winfrey Show's season finale of "Oprah's Search for World's Smartest and Most Talented Kids"
Cecilian Music Club Competition, Performance in Alice Tully Hall, NYC. Master Class with Marvin Blickenstaff at the University of Minnesota, Duluth, Minnesota.